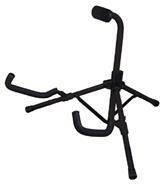 The HERCULES Guitar Stand GS412B features the Auto Grip System (AGS) yoke, the Comfort Grip, Specially Formulated Foam (SFF) rubber on all contact points, and the adjustable back rest. - The built-in Auto Grip System safely locks instrument in place. 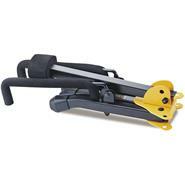 - The Comfort Grip with Locking Pin adjusts stand height quickly, easily and securely. - The Folding Back Rest supports instrument securely, has multi-angle position adjustment and folds up securely for travel. - Specially Formulated Rubber Foam fully protects instrument at all contact points.